It’s February 1st, which is the beginning of Black History Month here in the States. At the Raggy Waltz offices, we’re celebrating Black History Month by highlighting albums made by black artists. To kick off the official start of February, here’s quite possibly the most unpretentiously black album I own. With that, to the music! This is music not for the faint of heart. From the jump, the music takes you right in for a wild ride. Recorded during the midst of the civil rights movement, the music on this album was recorded at a benefit concert for the Black Arts Repertory Theatre/School in Harlem, New York live at the Village Gate jazz club. The Black Arts Repertory Theatre/School has its own interesting history, which I encourage you to Google, but briefly it was founded by poet and writer LeRoi Jones, soon to become Amiri Baraka. He started it soon after the assassination of Malcolm X in 1965 as a place for the development and free expression of black talent and culture. To kickstart his initiative, there was a jazz concert held at the Village Gate, one of the hippest, most ‘avante-garde’ jazz clubs in New York City. It brought together a variety of the most progressive black jazz musicians and they played the most far-out, progressive jazz of 1965. John Coltrane’s quartet is featured doing a brooding, searching version of “Nature Boy”. At least that’s what the title says. I didn’t actually hear the melody of “Nature Boy” played at all during the performance. It’s a modal vehicle for Coltrane; pianist McCoy Tyner doesn’t get any space to solo. The rest of the music is admittedly not my speed. Albert Ayler and his brother Donald get a performance of “Holy Ghost” is as out there as you can get. “Blue Free” features Grachan Moncur on trombone and Bobby Hutcherson on vibes and is more conventional jazz. The guys still get pretty far afield and free with it though. Archie Shepp and company are hand for “Hambone”, which starts off tame enough before careening towards the galaxies. That leaves “Brilliant Corners”. “Brilliant Corners”, written by Thelonious Monk, features the horns of Charles Tolliver and James Spaulding as well as the vibes of Bobby Hutcherson. Ubiquitous drummer Billy Higgins keeps things moving and Cecil McBee holds down the tonalities on bass. This track is the most conventional and swinging track on the entire album. There’s no piano on the track so the guys have nowhere to hide. Other than Hutcherson providing sparse harmonic seasoning, the soloists are on their own. Hearing Bobby Hutcherson in this setting is refreshing. His cool vibes (a cool instrument by nature) adds a stimulating shade of color for the music. The guys vary the song structure by playing alternating choruses with the tempo in half-time and in regular time, spinning tasty solos in the process. There was more music recorded at the concert, and a few more tracks appeared on a CD release of this album. As a whole, the music is a great time capsule of sorts for the time and place in which it was made. 1965 was a tumultuous year. Many black Americans were anxious, frustrated, angry, disillusioned, etc. All of that comes through the music on this record. It’s music that demands to be listened to actively- this isn’t music to have playing in the background! This album cover is a blatant attempt to capitalize off of the stardom (worship?) of John Coltrane, from the picture to his name being the first in the lineup. As per usual with Impulse album covers, the cover art is pretty bland and minimalist. Not to say it’s bad. The rich maroon cover with the picture of Coltrane mid-performance is nice. But that’s it. It’s just nice. One thing that I like about Impulse albums is their beautiful gate-fold style album jackets. Glossy, thick, and in bright technicolor, they truly stood out. 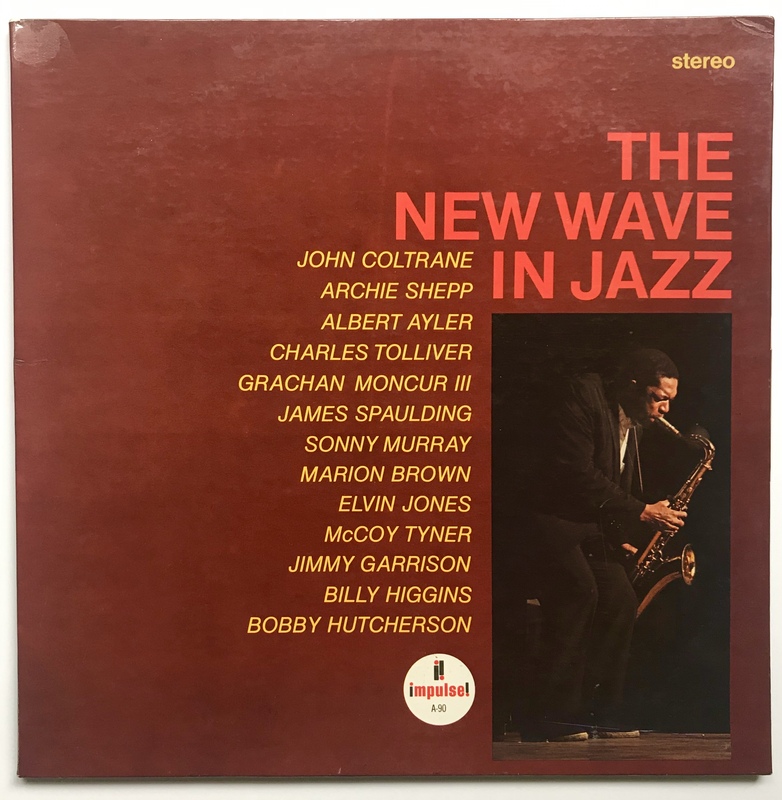 That last line (and the last line in the liner notes) speaks not just of the jazz on this album but of the jazz recorded during those turbulent years of the 1950’s and especially the 60’s. What do you think of these quotes? Do you agree or disagree? Recorded beautifully in living stereo by Rudy Van Gelder, this album was a fantastic and life-like listening experience. The club was acoustically blessed and it comes through the recording. The instruments are punchy and snap with life, and the stereo stage is perfectly set. Well done RVG. The labels are snappy as well, and ‘VAN GELDER’ is stamped into the runnout wax of both sides. The vinyl has a serrated edge, which I’m sure means something special. I don’t know what that something is though. If you know, do chime in. I found this album at my good old local record store, Vertical House Records. It was ‘only’ $20, which I gladly handed over for this album. For having been collecting records for over five years, this was my first original-pressing Impulse! album when I bought it last year. I’ll definitely be on the lookout for more. Hello and thanks for covering this record I was unfamiliar with! I have rarely if ever heard a cover of “Brilliant Corners” and I loved this one. I also think your “C” grade of the cover is fair.